OXFORD, Miss. 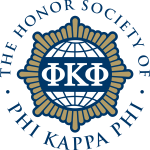 – Twenty-six undergraduate students and two graduate students from the School of Applied Sciences were inducted into the nation’s oldest and most selective multidisciplinary collegiate honor society, Phi Kappa Phi, on Sunday, October 29 at the Gertrude C. Ford Center for the Performing Arts. Phi Kappa Phi membership is by invitation-only, requiring nomination approval by the University of Mississippi chapter. Juniors must have completed at least 72 credit hours, with at least 24 semester hours at their current institution, and rank in the top 7.5 percent of their class. Seniors must have completed at least 90 credit hours, with at least 24 semester hours at their current institution, and rank in the top 10 percent of their class. Graduate students must have completed at least 18 graduate hours or the equivalent at their institution and rank in the top 10 percent of their class. Fall 2017 graduate initiates include Kelly Pratt and Shelby Whitsell. For more information about Phi Kappa Phi at Ole Miss, contact at Sheree Jones ​sgjones@olemiss.edu.